The magic of Cookies & Cocoa is back and better than ever! 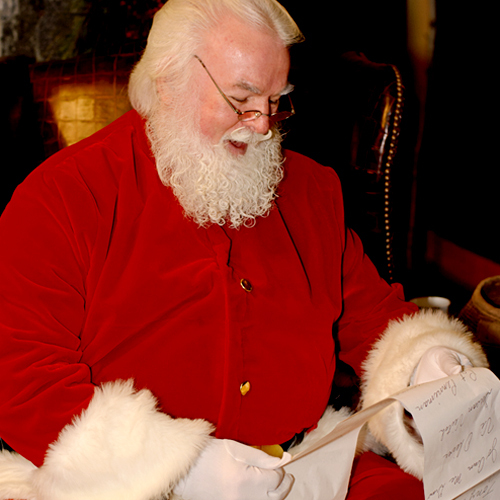 This year we are beyond excited to announce that we have the real Saratoga Santa! Each ticket will give you and your child an unforgettable experience to start off the Holiday Season right! You will start with Christmas Carols around our grand piano followed by a PRIVATE family visit with The Saratoga Santa complete with one professional family photo (digital download) from Susan Blackburn Photography. Santa will give each (ticketed) child a special commemorative ceramic mug which they can use to enjoy their Hot Cocoa in. Then grab a Mansion of Saratoga house made cookie and get ready to snuggle in and enjoy a Holiday Classic read aloud by the roar of our fireplace. *Tickets are only needed for children (Adults may accompany their children at no additional cost). *We ask that you arrive promptly at the listed START TIME of your ticket time slot - in order for this event to run smoothly. *Family Discount: For families with three or more children, you will automatically receive $10 OFF your total purchase price. *Division Street Elementary School Fundraiser/ Sunday, December 2nd: The Mansion of Saratoga is happy to continue giving back to Division Street Elementary for the 3rd year. Please note that 15% of the Cookies & Cocoa sales on Sunday, December 2nd will go directly to the Division Street Elementary PTA. *You are more than welcome to take personal photos throughout The Mansion during your visit with us but we kindly ask that you adhere to our No Personal Photography rule during your private visit with Santa. Please place your camera or phone down and enjoy this magical moment with your family…we have you covered, promise! After your Cookies and Cocoa with Santa please stay awhile and enjoy our Victorian Winter Market which is free to the public. This family friendly event will feature fine artisans, live music, food and other holiday surprises. We can't wait to see you! © 2019 ShowClix on behalf of The Mansion of Saratoga LLC. All sales are final. Tickets are non-refundable.